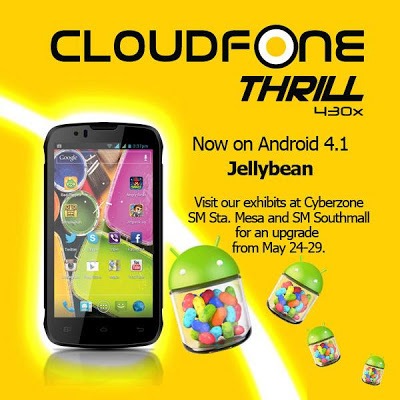 CloudFone announces the Jelly Bean update for their sough-after handset, the CloudFone Thrill 430x (check our review here). Your battery beast phone will be treated with Android 4.1 software update if you go to SM Sta. Mesa and SM Southmall Cyberzone from March 24 to 29. Good thing is they wont require any proof of purchase. Remember that this update is not OTA (over-the-air) . Just like any manual update, be sure to back up your phone before hitting these centers. Aside from Project Butter which gives you smoother experience, the Android 4.1 also gives the following features. I can always say that Android has an edge over Apple with its keyboard software due to smart predictive input and dictionary. With Jelly Bean, the feature has never been this good. But the most important enhancement is that you can do Voice Typing even when you’re offline. This means that no data connection is required, with its performance independent of its speed. Google also taps Knowledge Graph and built-in voice recognizer for this feature. Jelly Bean brings new interface and gestures in the new camera environment. You can now swipe sideways to access gallery just like what you have in your WP smartphones, swipe left to jump to the picture that you just took and delete pictures by swiping away them off-screen. A revamped notification bar has been conceptualized with a more prominent looking clock. It also allows you to fetch notifications from various apps like Music, Gmail, etc. to be expanded without even opening the app. You can even do actions like +1 in the notification panel. This new improved search app poses a significant threat to Siri. The native Google search app now has a natural language commands. Google Now, another part of Google Search can show your public transport listings, flight information and sports results just the way you wanted it to be. We'll have to check with our Thrill 430X once the update became available in our location. In the meantime, hit us also with your comments after you have upgraded to the buttery software.